From time to time we will change the waterbeds in our showroom. We may update our retailers display, or we may take away an unwanted waterbed when a customer is modernising and buying a new waterbed. 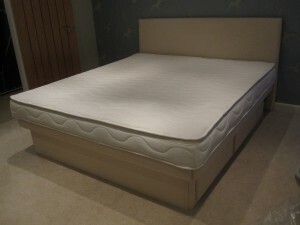 If the price of a new bed is out of your reach at this time, keep checking our ex-display & used waterbeds list. it is also worth pointing out that you may actually be surprised how low our prices are, visit our build a bed feature. This waterbed was fitted last night for a happy customer who previously owned a hardsided waterbed also purchased from High & Dry Manufacturing Ltd. This bed is shown with a four drawer base and Karma headboard. This option is available on our build a waterbed online feature.